Seth Rogen and Lauren Miller Rogen’s Hilarity for Charity (HFC), a movement founded as a resource for the millennial generation with a focus on supporting Alzheimer’s care and support, today announced that Amy Schumer, Jim Gaffigan and Colin Jost will bring their comedic talents to the Third Annual HFC NYC Variety Show on Thursday, June 8, 2017 at Webster Hall. 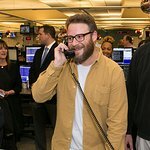 “I’m pumped we’ve got this level of talent joining us for the night, and even more pumped for our attendees to pour their money in to the hands of Hilarity for Charity,” said Rogen. Additional performances will be announced in the near future. HFC NYC complements the group’s marquee Los Angeles Variety show, and is hosted by a New York based committee led by Miller Rogen’s brother, Dan Miller. The event is expected to raise more than double last year’s $200,000 in contributions to help propel HFC’s mission. “I’m truly honored this impressive line-up of talented and passionate comedians wants to help bring awareness and support for Hilarity for Charity. We are looking forward to a night full of laughter, music and raising funds for such a worthy cause,” said Miller Rogen. Past HFC events have included performances and appearances by some of Hollywood’s biggest stars including Snoop Dogg, Aziz Ansari, Miley Cyrus, Judd Apatow, Joseph Gordon-Levitt, Michael Che, James Franco, Leslie Jones, Courtney Love, Mindy Kaling, The Backstreet Boys and many more. Since inception, HFC has raised over $6.5 million to benefit those affected by Alzheimer’s disease. For more information and to purchase tickets, please visit hilarityforcharity.org.